Want to find the best prices from the top manufacturers? Rounding out Nvidia's new 10-series graphics cards is the GTX 1050 on the budget end of things. The GPU companies these days are pushing these lower price cards as "eSports friendly," mainly because when it comes to the more graphically demanding games, the budget cards just aren't up to snuff. With just 2GB of VRAM, the GTX 1050 can just about handle 1080p gaming at medium settings. If that's fine for you, then this is a great choice which won't put a huge dent in your wallet. For the gaming enthusiast however, the GTX 1050 is essentially just a cheaper version of the GTX 950, as we outlined in our GTX 1050 review. It's got some architectural tweaks which might be more beneficial down the line, and it is indeed a few percent faster, but that's not much in the long run. One important thing to note is that the GTX 1050 does come out on top against the RX 460, AMD's new budget card, in a fair few games. Plus, when it comes to sheer performance per dollar, the GTX 1050 is high on the list, making it really good value if you can live with the performance downsides. 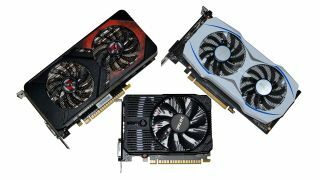 Below you'll find custom cards from the various graphics card manufacturers, and you'll find some improved specifications over the standard reference card. The standard card has a base clock speed of 1354MHz, and a boost clock speed of 1455MHz, while the memory is clocked at 7008MHz. The top dog of EVGA's line of GTX 1050 graphics cards is the FTW edition, which boasts a base / boost clock speed of 1442 / 1556MHz, as well as the company's dual fan ACX 3.0 cooler. EVGA says its cooler lasts longer than competitors, and is also cooler and quieter than the fans found on the reference card. EVGA also has a handful of other cards boosted to pretty high clock speeds too. MSI also has a pretty beefy overclock on its custom cards. The Gaming X 2G edition has the same clock speeds as the MSI card in OC Mode, at 1442 / 1556MHz base / boost, but it also has the memory bumped up to 7108MHz. Gaming Mode has pretty good specs of its own at 1417 / 1531MHz base / boost clock speed, and Silent Mode keeps things quiet by staying at the reference specs. Zotac has just the one GTX 1050 custom card available, and it's a Mini one in name and stature. Rocking the standard reference specs of 1354 / 1455MHz base / boost clock, it's not going to compete with many other cards on this list, however, it truly is very small with its single fan cooling design. Pretty cheap too, which is often what you're going for if you're thinking of buying a GTX 1050. Asus has a handful of lower end cards available, some of which stick to the reference card specs while adding the company's custom cooler. A couple also extend the fansink to take up two slots on your motherboard, so if you're looking to build a small PC with a little GTX 1050 inside, bear that in mind. Gigabyte has several cards available, and this is another company which adds in an OC Mode to their cards which boost the specs even further. The highest clock speed you'll find is on the G1 Gaming 2G version, which reached 1442 / 1556MHz base / boost clock speed in OC Mode. All of Gigabyte's cards use its custom Windforce cooler with two fans, apart from the smaller D5 2G which just has the one. Palit has just the one single fan configuration GTX 1050 available in the form of the StormX. You won't find any clock speed increases here, as it runs at the base / boost clock speeds of 1354 / 1455MHz, but you do get a custom TurboFan cooler, and it'll be quite cheap compared to some of the other cards on this list.